How to stop your allergies AND a world's first launches! Allergists are calling this year "the worst allergy season ever." Lots of information in this issue on how to use the products of the hive for allergy relief. I'm also thrilled to announce the launch of an exciting new product that I helped develop with my husband called HoneyMaxx. HoneyMaxx is the world's first honey-based sport and active lifestyle drink. If you sweat then HoneyMaxx might be for you. My husband's daughter is 6 and also has allergies to pollen, dander, dust and things of that nature so we started giving her a small amount of bee pollen with her breakfast and dinner and sure enough, she has suffered far less from her allergy symptoms. Even after they stopped taking it for a while their symptoms were less severe. However, we ran out, spring is here and so are their allergies!" Read more about what bee pollen can do for your allergies here. HoneyMaxx - A World's First! HoneyMaxx is the world's first honey-based sport and active lifestyle drink. If you run, walk, garden, do yoga or partake in any activity that causes you to sweat, then HoneyMaxx is for you. 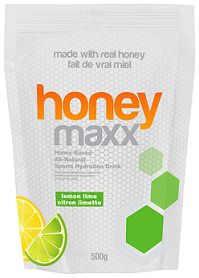 A low calorie, powdered drink that you mix with water, HoneyMaxx will supply you with honey-based energy and electrolytes to ensure that you have the energy to keep going while avoiding painful muscle cramps. With natural and organic flavoring and only natural ingredients, HoneyMaxx is the only sport and active lifestyle drink to contain no refined sugars. Perfect for your active children, HoneyMaxx is free of food coloring and GMO ingredients. View our entire selection of Propolis products here.